The JJ Project consists of pop singers JB (Im Jaebum) and Jinyoung (Park Jinyoung). The duo debuted May 2012 in the Korean entertainment industry, under the label JYP Entertainment, before debuting once again, this time joining with 7-member group GOT7 in January 2014. Nearly 5 years have passed since the release of “Bounce,” the duo’s first EP. “Tomorrow, Today” was written by both JB and Jinyoung, to form a unique combination of pop and alternative rock. Unlike previous work from the duo and more recent songs with their GOT7 counterparts, the track is more laid-back, and without GOT7’s rappers, the song solely consists of the harmonious melody of both singers. Not knowing what to expect from the song, I was pleasantly surprised by the relatable message of “Tomorrow, Today” upon a first listen. The song addresses the all-too-common feeling of uncertainty about the future. 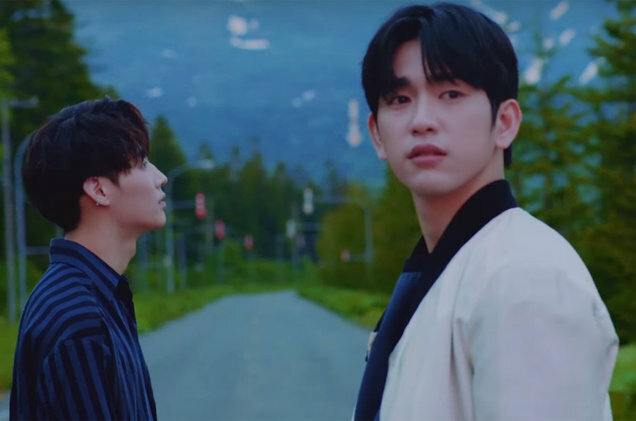 The music video symbolically portrays the lyrics’ message of ambiguity, by showing the two members taking a car ride leading down a long road, one that splits into two paths at the very end. Additional aspects of the music video, such as the scene with puzzle pieces strewn across the floor, convey the apprehension in the song, even if someone were unable to understand a word of Korean. Over the past week following the release of the track and its music video, Jinyoung and JB have performed “Tomorrow, Today” already on various Korean shows. They hit the Comeback Stage on Episode 535 of M Countdown, and were supported by enthusiastic fan chants at KBS2’s Music Bank and MBC’s Music Core. These live performances, along with a dance practice posted Aug. 1, highlight the duo’s choreography in addition to their vocals. Sharply contrasting much of the duo’s recent choreographies with their group, GOT7, JB and Jinyoung dance elegantly to match their more mellow song, while using two chairs as props. The rest of the album follows suit with more pop songs that are extremely catchy and danceable, from “On&On” to “Find You,” and the list ends with one solo song from each of the duo. JB and Jinyoung’s solos, “Fade Away” and “The Day” respectively, are currently only available for purchase on CD. Fans of the JJ Project, as well as new listeners, will not be disappointed by the long-awaited album.